Remember a week or so ago… I dusted off the heated propagator from the shed, excitedly whizzed it upstairs, and planted my first crops of the year: Kale and Tomatoes. For it was February. Spring is on its way. And these crops can be started early. Alas, I slightly cocked up on this one. Yes, it’s February, yes, Spring is on its way, and yes indeed, Kale and Tomatoes can be started early. Only not really… You see, there’s just not quite enough natural light yet. 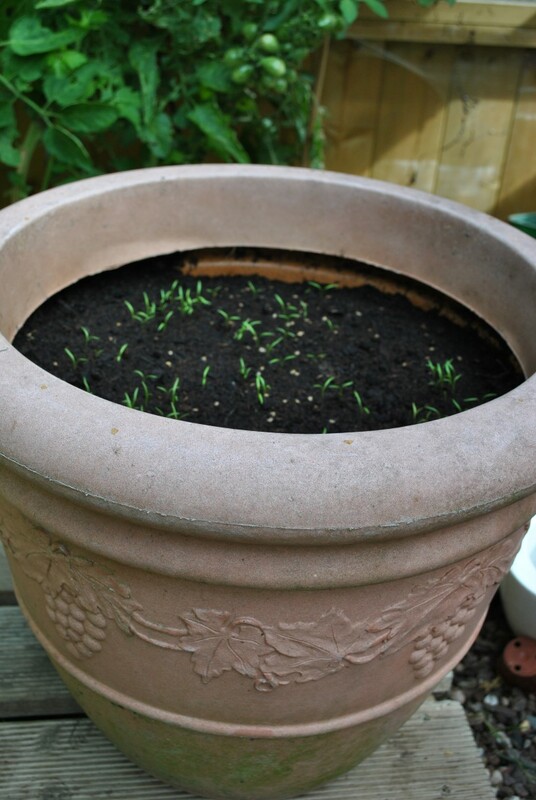 The seedlings all popped up, but as soon as they saw a sniff of the window, they scarpered off towards it. So I’ve ended up with comically long and spindly seedlings that have little or no chance of forming a second set of leaves and growing into healthy, bushy plants. An executive decision has therefore been made here at Chook Cottage. I am going to CHEAT! I know, I know… we all hate a cheater, but needs must. The vegetable plot here is more of a hobby – we’re not trying to live off the land – we just want a couple of fresh bits and bobs to harvest. The kale seeds only went in the propagator on Sunday, and THEY ARE GERMINATING! We absolutely love kale, and get through bags of the stuff… to be able to pick straight from the plot will be an absolute treat. I can’t express how excited I am to be growing stuff again. Spring is most definitely just around the corner, as the mornings and evenings are growing gradually lighter – I love this time of year, as it seems to tingle with anticipation of the start of a new season. 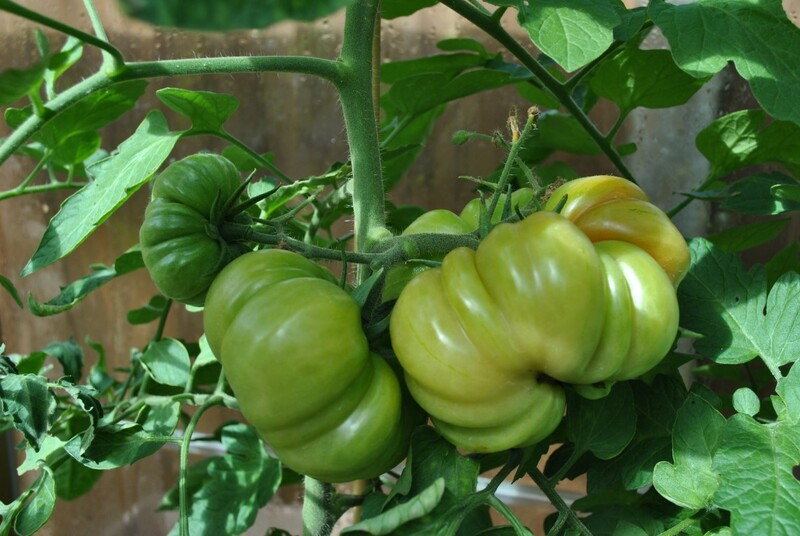 We just need the pear tomatoes to pop up their little heads now… I will be watching them intently! There’s a lot to be said for growing things from seed. True, you don’t get an instant garden like you would with buying plants, but it’s cheap, rewarding, and actually quite good fun. As the weather seems to be warming up nicely, I dug out my seed collection at the weekend. I appear to have acquired a vast collection of flower and vegetable seeds: mostly bought for a fraction of their original price in ‘end of season’ sales. There’s everything from beans to peas, from cosmos to cottage garden mixed. Some will be able to go straight out into the garden very soon, but others benefit from an earlier start inside. Looking around, it soon became apparent that I had nowhere near enough windowsills to house my collection, so off I popped and purchased a tiny greenhouse with a plastic cover. I’d decided when I began to plan the garden that there wasn’t space nor need for a big greenhouse, so this little one do the trick quite nicely. I positioned it in a sheltered spot that also had the benefit of good light and sun. A quick rummage in the shed produced some seed trays which I filled with compost, duly sprinkled seeds on the top and covered with another thin layer of compost. After firming all the soil down, the trays got a good water, and into the greenhouse they all went. So far I have Cosmos (brilliant for late summer/autumn blooms), Tagetes (apparently great for discouraging green and whitefly), some cherry tomatoes, and a couple of pots of sweet peas.. I’ve also sown a pot or two of dwarf French beans: the French beans I grew last year provided absolutely corking results, so I’m hoping for a similar re-run this year. Reading the remaining packets in my collection, some of the mixed seed collections instruct to sow straight into the ground. I’ve learned over time that certain plants don’t like to be messed about with, and don’t like to be started off in pots and then moved. So the next job was to tidy the areas that these seeds would be scattered in. The next couple of hours were happily spent grubbing around in the garden, digging out any weeds and grass from the borders: they are a lot easier to get out now than trying to negotiate around emerging seedlings later. That done, the mixed seeds were scattered around, and the borders got a quick rake over to bed them in. Next up was a water, and now I just have to sit back and wait for the results. Well, that’s what would happen normally. Me? I’m out there now every half an hour, it seems, peering into seed trays and soil, willing my little plants to grow. And today we had lift off. 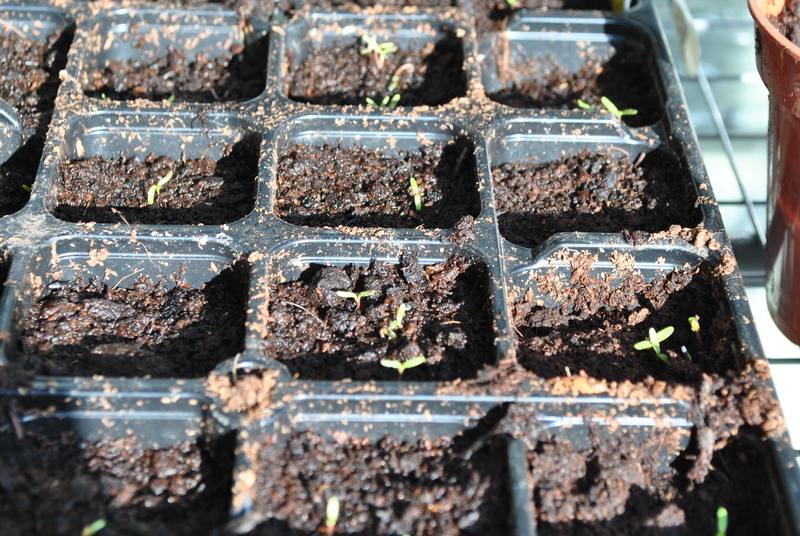 I present you with… the tiniest tagetes in the world! In no time at all I should have a myriad of colourful plants, and a garden that has the ideal ambience to attract butterflies, insects and bees. Slightly bemused but keen to know more, my interest was well and truly piqued… surely it was way too late to be putting carrots in: mine have all just been whipped OUT of the garden! 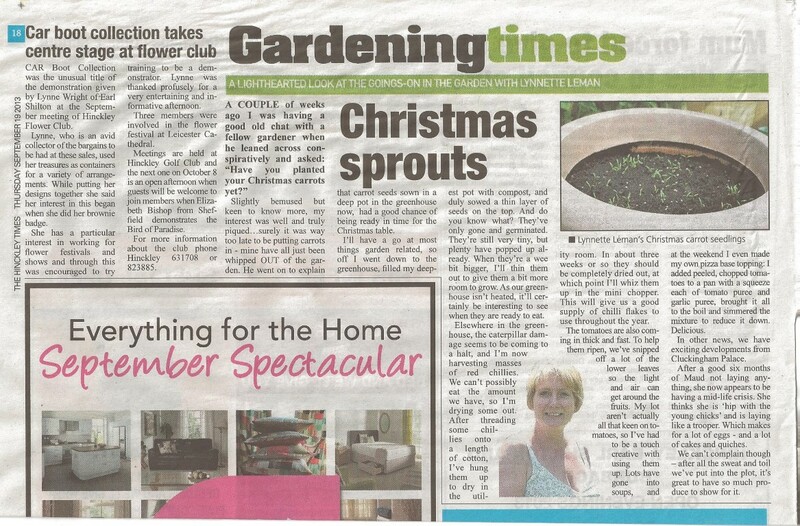 He went on to explain that carrot seeds sown in a deep pot in the greenhouse now, had a good chance of being ready in time for the Christmas table. I’ll have a go at most things garden related, so off I went down to the greenhouse, filled my deepest pot with compost, and duly sowed a thin layer of seeds on the top. And do you know what? They’ve only gone and germinated. They’re still very tiny, but plenty have popped up already. When they’re a wee bit bigger, I’ll thin them out to give them a bit more room to grow. As our greenhouse isn’t heated, it’ll certainly be interesting to see when they are ready to eat. Elsewhere in the greenhouse, the caterpillar damage seems to be coming to a halt, and I’m now harvesting masses of red chillies. We can’t possibly eat the amount we have, so I’m drying some out. After threading some chillies onto a length of cotton, I’ve hung them up to dry in the utility room. In about three weeks or so they should be completely dried out, at which point I’ll whiz them up in the mini chopper. This will give us a good supply of chilli flakes to use throughout the year. The tomatoes are also coming in thick and fast. To help them ripen, we’ve snipped off a lot of the lower leaves so the light and air can get around the fruits. My lot aren’t actually all that keen on tomatoes, so I’ve had to be a touch creative with using them up. Lots have gone into soups, and at the weekend I even made my own pizza base topping: I added peeled, chopped tomatoes to a pan with a squeeze each of tomato puree and garlic puree, brought it all to the boil and simmered the mixture to reduce it down. Delicious. In other news, we have exciting developments from Cluckingham Palace. After a good six months of Maud not laying anything, she now appears to be having a mid-life crisis. She thinks she is ‘hip with the young chicks’ and is laying like a trooper. Which makes for a lot of eggs: and a lot of cakes and quiches. We can’t complain though – after all the sweat and toil we’ve put into the plot, it’s great to have so much produce to show for it. 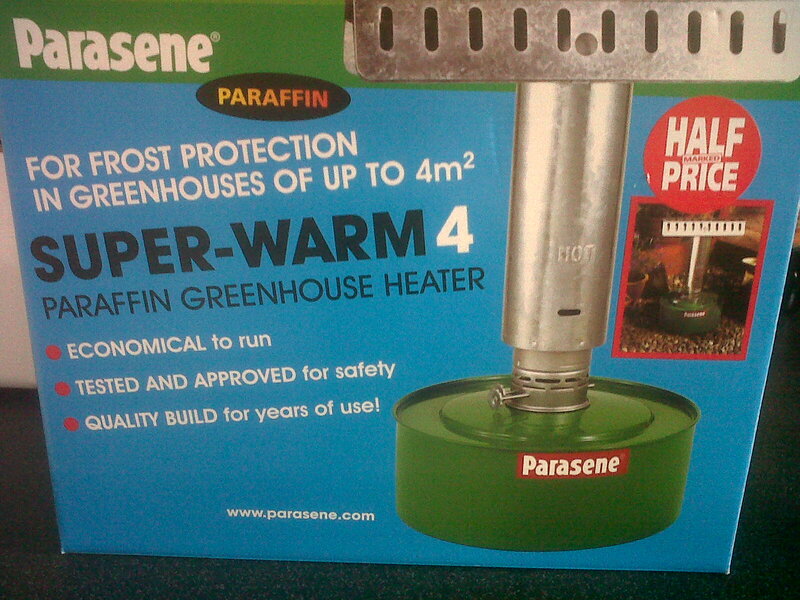 After umming and ahhing and weighing up the pros and cons of heating the greenhouse, I’m happy to report that I’m now the proud owner of a Superwarm 4. Last night’s frost had wriggled its way into the greenhouse, so I was greeted this morning by a fine layer of ice on the inside. Not, I would imagine, the best morning call for my seeds that I’d planted in there last weekend. Decision made, I shot off into town this morning to snaffle up a paraffin heater that I’d spotted in Wilko’s before Christmas. £25 smackeroonies, which seemed a fair price to pay if it meant that the plants survived the winter – or maybe even got a head start. Well, imagine my delight to find the very last one in the shop – and at half price. £12! For the price of a few bottles of wine, I’ve now got a sub-tropical paradise in my garden. I imagine I’ll soon be growing bananas and all sorts down there, and fully anticipate tomatoes the size of melons. 50 light-hearted tales of a typical year in the garden. A compilation of all The Hinckley Times articles of 2012, plus other tales.